Millions of BitTorrent users preferred uTorrent as their first Alternative choice. But the scenario has much changed since BitTorrent.Inc overtook it and filled it with advertisements and adwares. Nowadays, there are many Bittorrent alternatives which give you high speed and many advanced features and the best part is that most of them do not put advertisements or load junkwares into your PC. The Biggest alternative to bit torrent is utorrent that we all know about. But in this article we will show you lesser known better bittorrent alternatives available today. Update: – One of the best Alternative transmission which was earlier for Mac is available for windows Now. Download it here. Many users prefer Deluge over other uTorrent alternatives because it closely resembles uTorrent before BitTorrent Inc. spammed it with advertisements and adware. It is an open source and cross platform BitTorrent client with good speed. And the best part is if you are using it, there will be no damaging spywares sneaking into your system. It is lightweight but it offers many interesting features to its users such as BitTorrent encryption, DHT, peer exchange, magnet URLs, RSS UPnP, Bandwidth scheduling and many more. If you are an uTorrent user and now making a switch to other alternatives with a similar interface then qBittorrent can be a very good option for you. Like Deluge, qBittorrent is another cross-platform, open-source, and free of any advertisements or adware. This BitTorrent client is loaded with features like UpnP/NAT-PMP port forwarding, upload and download speed management and also provide support for proxy servers. 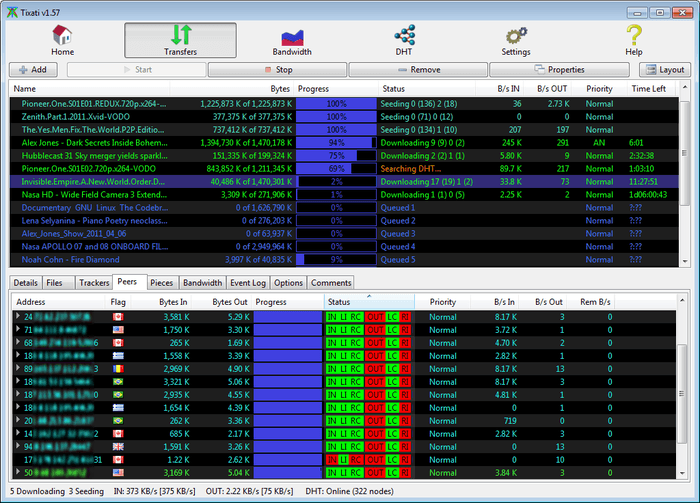 In addition to this, one can also find here advanced controls for trackers, peers, and torrents. Vuze Leap and Vuze are two different variations by the same developer. It is a closed source and quite different from uTorrent interface. Though it is said to be lightweight but actually it is not. It has a sleek interface and packed with advanced features like file transcoding, remote control, plugin support, filters to name a few. Vuze interface includes a sidebar that has features like Library, Subscription, and Notification. And in the Vuze HD section, you can sync content to handhelds, handsets, and other gear. Overall, it is recommended for advanced users for its heavy features because beginner level users may find it a bit using it. It is compatible with Windows XP, Windows Vista, Windows 7, and also with Mac OSx 10.5. Another easy to use new BitTorrent client is Tixati which has a powerful P2P system. This new powerful yet simple to use uTorrent is 100% free and there will be no spyware or unwanted advertisements during downloading. It is compatible with Linux, Unix and Windows. It allows users to download large files with great efficiency. Some of its advanced features include peer connection encryption for added security. Tribler is a peer to peer and decentralized BitTorrent client that is getting a lot of attention among users. It is an open source and ads-free and the best part of Tribler is that it lets you search for and download your desired content without visiting the torrent websites. It can be a good choice who like to find, and share various contents such as video, audio, pictures, etc. File sharing can be an enjoyable experience here with anti-spam measures using channels. Tribler users can enjoy a Tor-like onion routing network exclusively for torrent downloading which many traditional BitTorrent clients don’t offer. However, it has a few disadvantages because it is still in its developing stage and need a few fixes. Transmission is another good option if you are looking for an easy to use and open source uTorrent alternative which is free of adwares. It is good for downloading movies, games, software, etc. Beginner level user will find it comfortable to use because it is lightweight yet offers plenty of features such as tweaks, web based interface, encryption, peer exchange, NAT-PMP port, tracker editing and a lot more. It is free and compatible with Mac OS X, Mountain Lion, Mavericks, Yosemite and Linux. It also unofficially supports Windows XP, Windows 7, and Windows8.